The Ebay dealer’s offering of “three journals about Jamaica Plains, Mass” was priced right even though the conditions he described ranged from good to fair to poor. 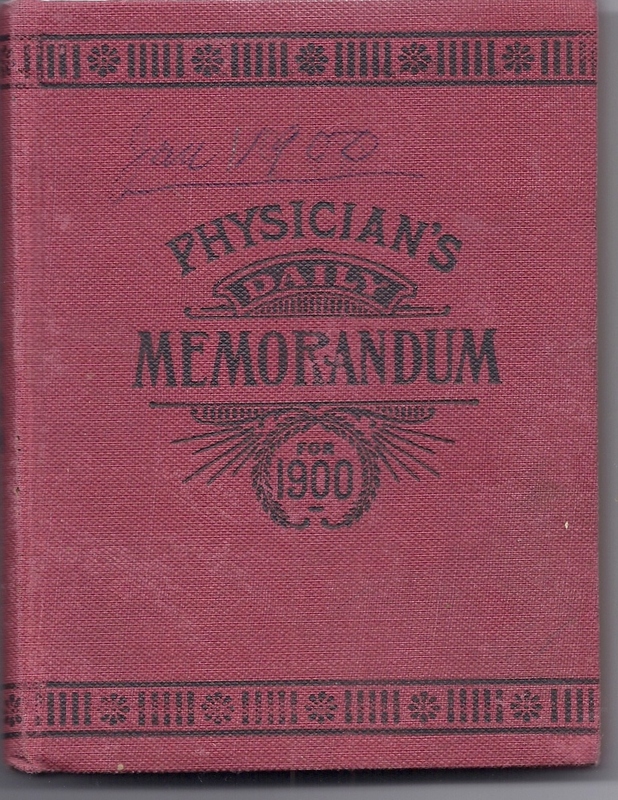 (1) 4 x 5.5 inch, red, cloth-bound daily memo book entitled “Physician’s Daily Memorandum, for 1900,” produced by M. J. Breitenbach Co., 100 Warren St., New York, NY. It was in good condition. 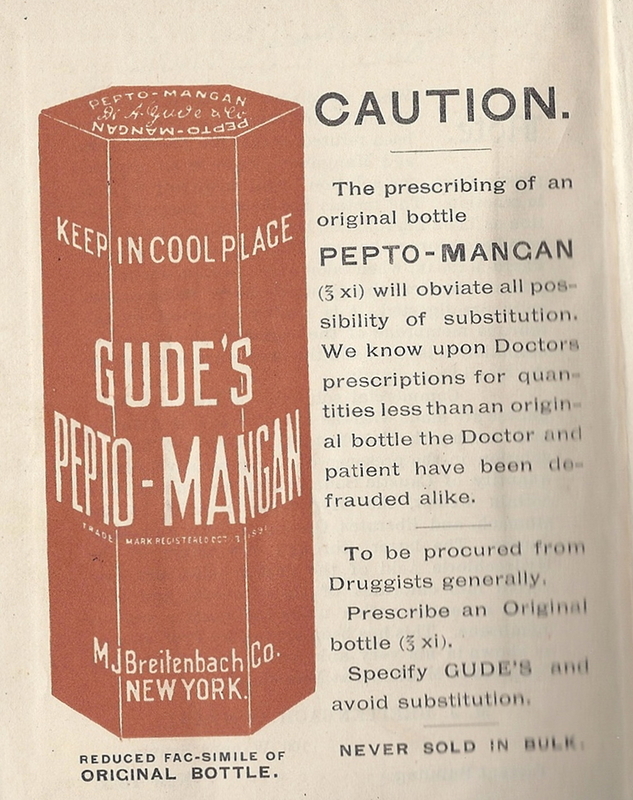 Breitenbach manufactured Gude’s Pepto-Mangan, a mixture of iron and manganese. Pepto-Mangan was claimed to cure a seemingly endless list of ailments. In fact, every single dated page of this memo book carried an endorsement of the product by doctors and hospitals across the country, with examples of remarkable successes with the product. So, the diary, as it were, was an advertising handout, like the wall, wallet, desk and leather-bound calendars I get at a local bank every December, as I promise to one day make a deposit there. The preliminary pages of the memo book are gone, and they may have identified the diarist who made penciled entries on several of the dated pages throughout the year. The scattered notes record some daily weather conditions, household chores needing attention, planned visits to Burroughs Street, references to someone named “Bert,” and mention of a JP Minstrel Show. There are trips to Quissett Harbor in Falmouth via Sippewissett Road. 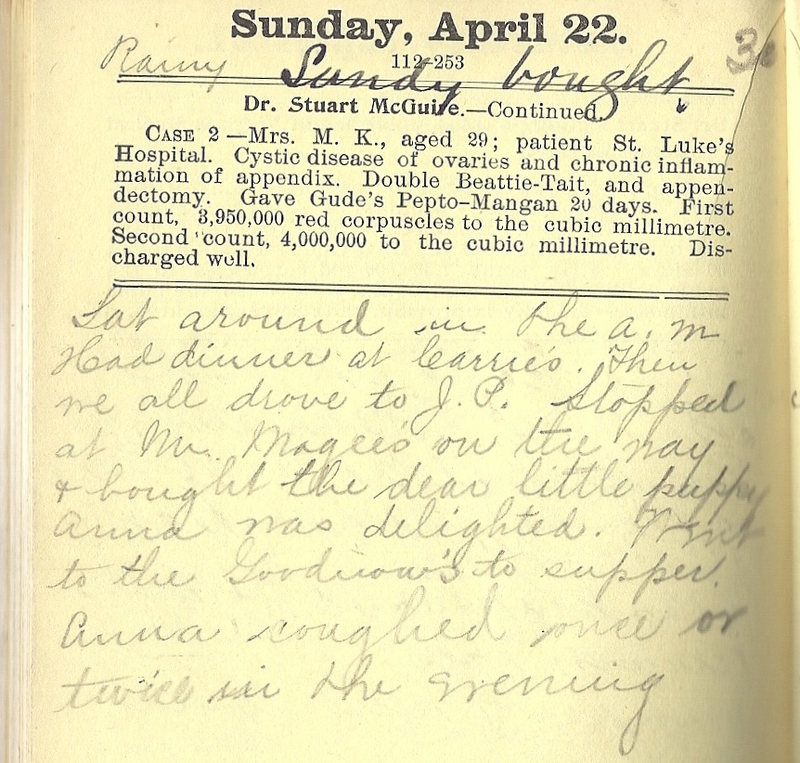 The writer’s current ailments are described, as well as the hiring and firing of maids, and docking one girl a week’s pay of $10 for failing to give adequate notice of her departure. (2) 5.5 x 8 inch school workbook, in fair condition. It is signed, in a beautiful hand, by “Etta F. Barton, 742 Centre St, Jamaica Plain, Mass.” It is labeled as a geometry workbook and is full of diagrams, formulae and solutions. (3) 5.5 x 8 inch school workbook. It is in very poor condition with the covers just barely hanging on. 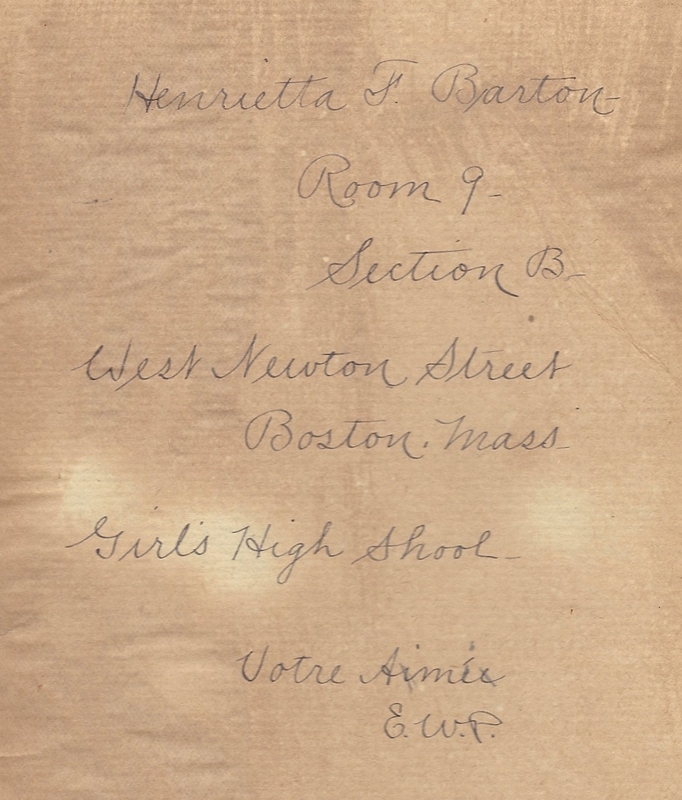 The book is labeled on the inside of the front cover, in a neat hand, “Henrietta F. Barton, Room 9, Section B, Girls High School, West Newton Street, Boston.” It is a very detailed history notebook, written in both ink and pencil. In one of the workbooks, an undated and unsigned letter from Winchester, NH, addressed to “May,” mentions “Grandma and Grandpa Goodnow,” and that the writer may be “the first automobilist to climb some of the hills” they negotiated to get to the home of Grandpa Goodnow’s only aunt, Minerva, after visiting Doane’s Falls in Royalston, MA. It also describes a side trip in a two-horse, three-seat buckboard to a farm where J.W. [Goodnow?] lived after his mother remarried. Henrietta (Etta) F. Barton was born on March 2, 1872 at Walnut Avenue in Jamaica Plain. Her parents were Henry W. Barton and Mary A. Sadler, both of whom were born in England. Henry was a lamplighter. In 1880, Henrietta had eight siblings ranging from ages three to twenty-two. Henrietta was the diarist who made the entries in the red memo book, as we shall see as the pieces come together. By 1883, the Bartons were living on South Street in Jamaica Plain, opposite Keyes Street, the present McBride Street. By 1890, they were residing at 742 Centre Street between Harris Avenue and Greenough Avenue, and Henry continued working as a lamplighter. On June 28, 1893, Henrietta married Albert (Bert) W. Goodnow. Albert was born on March 29, 1871, in Jamaica Plain. He was the son of Joseph W. and Helen M. Goodnow. Joseph was born in Vermont in December 1843. Helen was born in New Hampshire in 1842. Joseph and Helen were married in 1869. Joseph and Helen Goodnow lived at 27 Burroughs Street in Jamaica Plain. Joseph is listed as a baker and confectioner, and later as owner of a stable at 716 Centre Street. Some sources indicate that by 1910, he may have become a real estate broker. The Goodnow stable was destroyed by fire in January of 19171. One of the horses lost belonged to the farrier, John Mahoney. In 1925, John owned the blacksmith shop at 10 McBride Street, next to the Coffee Tree Inn. That shop had been started by Ignatius J. Craffey, about 1910, and after Mahoney, it was owned to the 1950s by James “Jimmy” Lovett. Albert was a partner in Ranlet & Goodnow, Hay and Grain Dealers, located in the Grain Exchange Building in Boston. He lived with his wife Henrietta and daughter, Anna, at 27 Robinwood Avenue, Jamaica Plain. Their household included maids, Charlotte M. Swanson, and later, Kate Corkum, and still later, Katherine McHale. Their coachman, James Crocker, also lived with them. Albert and Henrietta’s daughter, Anna, was born in Jamaica Plain, September 16, 1894. When grown, Anna married Farnsworth Keith Baker, of Falmouth. Anna and Farnsworth had three children. Farnsworth K. Baker was born in Boston in 1894 and raised in Falmouth. He was the son of a Boston realtor, Edward F. Baker. He graduated from Harvard in 1917. Farnsworth was a WWII navy veteran and a history teacher at Falmouth High School. At one time he was listed as owner of properties at 90 and 112 Dudley Street, Boston. He was a musician and a charter boat captain. 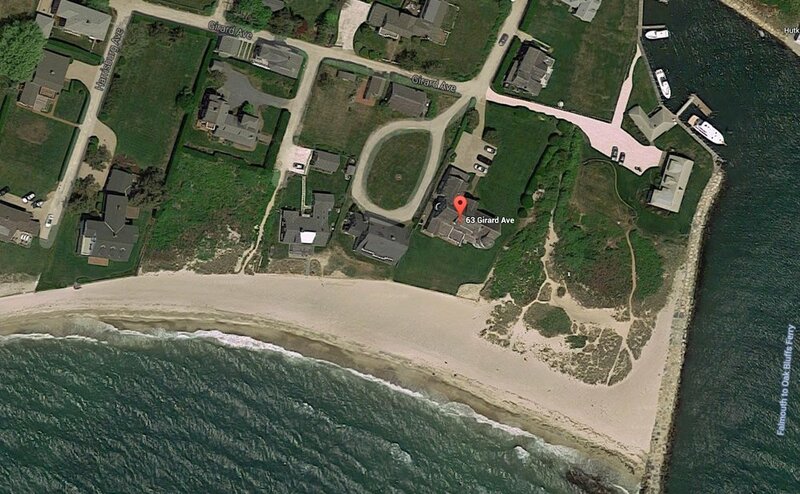 He and Anna lived at 189 Clinton Avenue, Falmouth. Albert and Henrietta Goodnow were long-time summer residents of Falmouth and in 1900 were one of only 13 families summering in Falmouth. In October, 1887, Joseph W. Goodnow, the baker and confectioner from Jamaica Plain, bought a large tract near Deacon’s Pond which was fed by the Herring River. Joseph acquired the land from the heirs of master mariner William H. Bourne. The pond and river would later be dredged to form Falmouth inner harbor. Part of this tract was deeded to the state in 1907 by Albert Goodnow for digging the inner harbor. The spoil from the dredging was used as fill along Girard Avenue, and the house at 79 Girard sits upon that fill. Joseph sold that site to Norwood realtor Erwin A. Bigelow. In July 1902, Bigelow sold the land, in two deeds, to Henrietta Goodnow. By 1910 the Goodnows had built a house on the western part of this tract at 63 Girard Avenue. And by that year, Joseph Goodnow was a real estate broker. Sometime before 1907, Albert Goodnow bought and sold several lots in the area. In 1907, Henrietta sold 1.5 acres of this tract to Marion C. Robinson of Houghton, Michigan, whose husband, Dean, was an attorney. Robinson then sold the land at 79 Girard Avenue to Maxwell J. Lowry in 1917, and Lowry built the house there in 1919. Lowry, a wholesale patent leather merchant, owned a plant in Mansfield, MA which colored patent leather black. The house was modified in the 1930s and the Lowrys summered there until 1947. In 1924, Farnsworth Baker, Albert and Henrietta’s son-in-law, bought a large piece of land fronting on Clinton and Queen streets. He subdivided the parcel into 62 house lots and laid out new roads including Harborway (now Swing Lane,) Richards Road and Bourne (now Lowry) Road, Lewis (now Belvidere) Road, Hatch Road and Robinson Road. His father-in-law, Albert Goodnow, built the first house on Swing Lane at #45 in about 1924. In September 1939 Farnsworth Baker sold lot 4, upon which 45 Swing Lane stood, and adjoining lot 5 to Charles Stuart Robertson, a Taunton curtain manufacturer. Swing Lane was renamed for his wife, Elizabeth (Swing) Robertson. Farnsworth K. Baker was involved in development of the area until about 1941 when he sold 12 lots at the northern end of Lewis (now Belvidere) Road to John F Ferreira. And so, what was originally a summer retreat in Falmouth for the Goodnows of Jamaica Plain, became a family enterprise, developing prime oceanfront land. It involved Joseph Goodnow and his son, Albert, and daughter-in-law, Henrietta Goodnow. Albert and Henrietta’s son-in-law, Farnsworth Keith Baker, carried on the enterprise to the 1940s. By then, Farnsworth’s mother-in-law, Henrietta F. (Barton) Goodnow, was living with him at 189 Clinton Avenue in Falmouth, a long way from 742 Centre Street, Jamaica Plain. 1. Courtesy Mark Bulger and “Remember Jamaica Plain?” [blog]. 3. Zillow.com real estate website. Production assistance provided by Kathy Griffin.